Link building just might be the most misunderstood aspect of SEO. Any experienced digital marketer knows that links play a role in Google’s evaluation of a site. But how exactly does Google’s algorithm use links when determining a site’s authority? Are backlinks received from press releases or social mentions helpful for SEO? Are multiple links from the same site equally impactful? And most importantly, where should a marketer start when it comes to building backlinks? In this article, I’ll lay a foundation for understanding the history of backlinks, answer a myriad of FAQs about backlinks, and ultimately touch on the benefits of backlinks when it comes to a site’s organic, “earned” visibility in search engines. But first, let’s take a look at the anatomy of a backlink. There’s more to a backlink than meets the eye. While some components of a backlink – like the start and end of a link tag – are fairly self-explanatory, others are more complicated. Destination URL refers to the page that users are sent to after clicking on a link. In the example above, http://victoriousseo.com/seo-company-san-francisco/ is the destination URL of the link. It’s worth noting, however, that a link’s destination URL isn’t visible while browsing through a site or reading content. In order to access the source code of the link and view a link’s destination URL, highlight a link, right click, and choose ‘Inspect’. Anchor text is the word or words that make up the visible link on a page. Anchor text is often stylized in a color that varies from standard text, and is underlined and/or bolded to stand out from standard copy. Anchor text serves as a simple way to communicate the page contents of a link’s destination URL for users, but it also serves an important purpose when it comes to SEO. Just as links allow users to navigate from page to page on site, they also help search engine bots or “spiders” to discover new pages and, ultimately, decide how to rank those pages for specific keywords. Anchor text then is critical for search engines because it communicates which keyword themes should be “owned” by a link’s destination URL. If a search engine spider crawls a link with non-descriptive anchor text, there’s still a strong likelihood that it will discover the content of the link’s destination URL, but if the same link utilized a descriptive anchor text, the power of the destination URL’s content is magnified, and the page’s ability to rank well in search results is improved. On one hand, Google has been candid about the fact that backlinks are everything. On the other hand, it’s very clear that acquiring backlinks without an understanding of how search engines view links or a strategy to ensure you’re getting the right kind of links is putting the cart before the horse. So why are backlinks so damn important? The simple answer is that each backlink represents a vote of confidence about a page. Thus, measuring a site’s backlink portfolio is a method of measuring how frequently others consider it to be authoritative – or at the very least, authoritative enough to be referenced. The thinking follows that when someone links to a site, they are essentially saying the site is a good resource and should be rewarded as such within search rankings. Google began its rise to dominance in the search engine market in the late 1990s when one of Google’s founders, Larry Page, invented PageRank, which Google used to measure the quality of a page based in part on the number of links pointing to it. As PageRank was added to the overall ranking algorithm, it became more clear that inspecting a site’s link profile was an effective method of determining it’s quality. Why was PageRank such a breakthrough? Until PageRank was rolled out, Google’s algorithm more or less equated backlinks (of any kind) with authority. And while this was a step in the right direction, it didn’t take into account the quality of the link’s domain, the location of the link within a page’s content, or the reason why the link had been given in the first place. This lead to an algorithm that was too simplistic to accurately judge whether a site was truly authoritative and valuable for searchers, or whether a site’s owner had simply gamed the system and been rewarded with rankings. At that point, Google’s webspam team began actively working to uncover websites that were manipulating search results, and began rolling out regular updates to its algorithm which were specifically aimed at filtering out websites that didn’t deserve to rank. If you’re interested in learning more about what Google currently considers low quality, ineffective, spammy link building, this is a great resource. In the past few years, Google has gone a step farther, penalizing sites who have overused link building techniques – such as using keyword-specific anchor texts in every link to a page – and therefore, “over-optimized” their site. Google’s Penguin updates are one such example. A Google engineer would agree that it’s an understatement to say that Google’s algorithm is complex. Nonetheless, we know that Google’s algorithm utilizes backlinks in a very specific way when determining rankings. Google views a site’s referring domains as a major indication of whether or not a site’s content itself is valuable and worth prioritizing a sin search results. But it isn’t merely the number of backlinks pointing to a site that Google evaluates when determining rankings. In order to prevent spammy sites from gaming the system by building large amounts of links via a single site, known as a “link farm”, the algorithm was updated to go a step further and evaluate the number of unique domains that refer to a site as well. In doing so, Google devalues all backlinks acquired by a single domain after the very first link; even more, Google’s webspam team considers this kind of link building unnatural and isn’t afraid to hand out manual penalties to sites that don’t follow Google Webmaster Guidelines. Thus, it’s not merely the quantity of backlinks, but also the quantity of unique referring domains pointing to a site that determines where it will rank organically. It’s often useful to think of backlinks coming from unique referring domains as votes of popularity for a particular site. The more votes received from trusted voters, the more likely a site is to receive visibility in Google searches. But remember: the value of every vote after the first is discounted accordingly. Note: It would be foolish not to reference the quality of the referring domain and the backlink itself here. As you can probably already guess, quality means everything when it comes to effective, white hat link building. To get a pulse on where metrics like Domain Authority, Page Authority, and Spam Score come into play, continue on to FAQs about backlinks below. There are two things to take into consideration here. The first is that popular sites like Forbes often set meta robots on their blog to nofollow, meaning that any and all links on the page will not be followed by search engine spiders, nor will they be attributed to the link’s destination URL as link equity and authority. 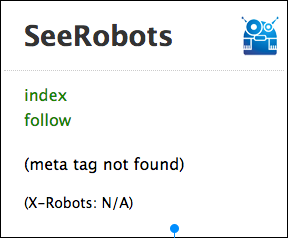 There are several ways to check a page’s meta robots, but the easiest way to access this information is via SeeRobots, a free Chrome plugin that changes colors based upon the page’s meta robots. In actuality, DA is a superficial metric (i.e. one that attempts to calculate the authority of a domain, rather than one that is metric baked into the search engine) that is a good lagging indicator that a competitor’s site may be more or less authoritative than yours, rather than a map to determining which site’s are the most authoritative. A good example of this is the fact that from January 2017 to December 2017, Victorious’ Domain Authority dipped from 31 to 28. And yet, during the very same window of time, the site’s ranking keywords boomed. What Domain Authority does for a domain, Page Authority (PA) does on the page level. Like Domain Authority, Page Authority returns a number between 1 and 100 that measures the authority and ranking potential for keywords related to that page. While the value of DA is often blown out of proportion in the SEO industry and viewed by some as an ultimate measurement of a site’s authority, PA often receives the opposite treatment and is forgotten completely. Given the ongoing improvements made to Google’s algorithm, the context of a link is now more valuable than ever. Thus, the popularity and authority of the content housing a link are both important aspects that contribute to or detract from a link’s impact. For example, if you receive a link within a piece of content that has been active for 15 years, its Page Authority will be much higher than a link within a piece of content that went live yesterday. In short, one backlink with a 7/17 spam score is not something to be worried about. However, 70 backlinks with a 7/17 spam score may be. Spam score is a metric (also created by Moz) that evaluates the potential for a backlink to be spammy or harmful. It does this by checking each link against 17 unique factors called “spam flags” that could potentially put your site at risk. With that said, it’s very important to regularly check the overall health of your site’s backlink portfolio to ensure that your site is not at risk of being penalized. The best approach to doing this is a backlink checker like SEMRush’s Backlink Audit Tool. Simply plug in your domain’s URL and wait to see whether your domain’s toxicity score is high, medium or low, as well as which domains are seen as toxic. In the event that your domain’s Overall Toxicity Score is High, compile a list of all toxic domains linking to your site into a disavow file and submit the file via Google Search Console. In doing so, you’re communicating to Google’s webspam team that you’re aware of the toxic links your site has accrued, and that you’d like them disavowed permanently so that they’re aren’t counted against you. A good rule of thumb is to keep all SEO tactics – including link building – as natural as possible. The minute a tactic leads to a page’s content seeming unnatural to users, there is a good chance that Google won’t like it either. Ultimately, this stems from the fact that one of Google’s highest priorities will always be maintaining an excellent user experience for individuals using the search engine. With that said, it’s also natural to run into misspellings, errors in sentence structure and grammar, and even incoherent thought progression from time to time in content on the web. So don’t be alarmed if the design of the domains linking to you are subpar, or the domain name itself is strange. More than anything else, it’s the thematic relevance of the content housing a backlink that matters within Google’s algorithm. If you run an automotive business and most of the backlinks pointing to your site are within content that talks about parenting, it’s safe to assume those links are going to be devalued compared to links housed within content that talks about car maintenance, auto repair, auto parts, and the like. Backlinks with contextual relevance are especially valuable because they provide a stronger sense of semantic authority for the destination URL of a backlink. In short, anchor texts are the most often misunderstood component of backlinks. As such, they’re also the most underutilized. Links with a branded, generic, or URL anchor text are powerful in that they establish a vote of confidence and further extend the brand authority of the destination URL. However, keyword-specific anchor text is able to do much more. By linking to a site with a keyword rich anchor text, you’re effectively telling Google not only that the link’s destination URL is authoritative, but that it’s authoritative for a specific, non-branded set of keywords. Because of this, acquiring backlinks with generic anchor text is good, but acquiring backlinks with keyword rich anchor text is even better. If you’re looking to expedite ranking growth for a specific page and you know a competitor is accruing links at a much higher rate, building links with keyword rich anchor texts will give you the opportunity to narrow the gap more quickly. There’s lots to discuss when it comes to backlinks from PR, social media, and web 2.0 sites like Weebly, Tumblr, and Blogspot. Let’s break each down individually. Press releases often provide one or two backlinks with generic, URL, or branded anchor text, which can be helpful to build brand authority and overall domain authority. With that said, press releases can be a tricky and frustrating approach to link building because they tend to “fall off” after a short period of time. Thus, the links you gain from a press are not permanent links, and will not be counted to your overall domain authority in the long term. It’s important to mention that if you work with a PR agency, placing a single press release on a noteworthy site, it may be possible to acquire a link with keyword rich anchor text. If this is the case, capitalize on the opportunity! However, if you’re submitting a press release to a newswire to be syndicated across tens or hundreds of sites, never use keyword rich anchor text. Doing so puts your site at elevated risk of the over-optimization penalty spoken about earlier. Social media links do provide some value when it comes to link building – mainly in the form of providing a social footprint that proves your site is associated with a recognized brand with fans, followers and customers. More than ever before, Google’s algorithm now utilizes a multi-faceted approach to rankings that takes into social media as a way of further validating or disproving what it’s core algorithm is identifying via on-page, content, links, etc. In short, web 2.0 sites – blogging sites that allow you to create free sites as a subdomain – do not offer a valid link building opportunity and are seen as spammy by Google. Additionally, many of the links from web 2.0 sites are nofollow and are not crawled by search engine spiders at all. This is the approach that any cheap, low quality SEO would take to link building and is an avenue worth altogether avoiding. Using Private Blog Networks (PBNs) for link building is a high-risk strategy. In order to understand why, we have to first understand more about the nature of PBNs and how Google views them. PBNs are sites that have been created with the sole purpose of selling links as a product. They typically have low quality content with no topical focus, strange domain names, and may share their theme with a number of other sites. But ultimately, it isn’t any of these attributes that puts you at risk of being penalized with Google. The risky aspect of PBNs comes down to the fact that purchasing links is ultimately against Google’s Webmaster Guidelines. Thus, if you do engage with PBNs, ensure that they are high quality; if they aren’t, there’s a good chance that Google already has you on their shortlist of sites to receive a manual action. While backlinks and mentions from popular sites will always be valuable in terms of increasing brand visibility and establishing business legitimacy, the SEO impact of these links can be short lived. For instance, a single link from the Wall Street Journal – especially a link with keyword rich anchor text – will undoubtedly grow the destination URL’s authority for the keyword theme related to the anchor text. But what about every other theme on your site? In an ideal scenario, each high value page on a site should receive a backlink from a trustworthy, established domain once per month (whether or not the domain is noteworthy ultimately is a much lower priority). In most cases, if each high value page on a site received one link per month, it will see the ranking increases necessary to drive real traffic and conversions over time. On the other hand, if a site only received one or two links a month, the amount of sitewide organic growth will undoubtedly be limited. Thus, several backlinks from unknown, but nonetheless authoritative sites will almost always be the better option. Guest posting will always be the place to begin. Your best bet is to compile a list of respected blogs that write about topics related to your product or service offering, checking each blog for a contact email to submit inquiries. If the blog has an editorial department, start there. In terms of outreach, the best approach involves pitching two or three topics you could write on as an authority and see if they would be interested in inviting you to be a guest contributor. At that point, if you’re finding it’s still difficult to get bites on your requests, try guest posting on sites you already have relationships with and including references to your work in your initial outreach email. Outside of traditional guest posting, there are other approaches to acquiring backlinks in a way that follows Webmaster Guidelines. One of these is called HARO, Help a Reporter Out. By signing up as a journalist on HARO, you will have daily access to hundreds of stories being written by trusted publications that are in need of a quote, anecdote, or form of subject matter expertise on a topic. Your reward for providing a reporter what they need? A dofollow backlink. The Benefits of Backlinks: Do Links Really Lead to ROI? The screenshot below is taken from an SEO initiative run by Victorious for an enterprise SaaS company in late 2016 and early 2017. In December 2016, Victorious implemented a technical audit of the site, which lead to quick growth of 250 positions for a set of high value targeted keywords. At that point, all SEO activity to these pages paused, as the company decided to hold off on link building for a few months. Without corresponding signs of off-page authority to compliment the on-page optimization that occurred during the audit process, the site’s rankings were capped. At the tail end of January – over a month after the audit was implemented – rankings began to decrease. Google has already determined the site itself to be authoritative; the algorithm was now waiting to see other sites provide a vote of confidence that they too saw the site as authoritative. 171% year-over-year growth in organic landings targeted landing pages during the first year of partnership. Citation flow increased from 42 to 49 during the first six months of link building. Trust flow increased from 27 to 37 during the first year of link building. The graph above isn’t an outlier. In fact, every site that begins with an audit and chooses not to engage in link building sees the exact same trajectory. Link building leads to sustained rankings increases, which in turn lead to organic traffic, and eventually, to conversions. With every algorithm update comes a slew of new methods promising to optimize sites and bring page 1 rankings overnight. 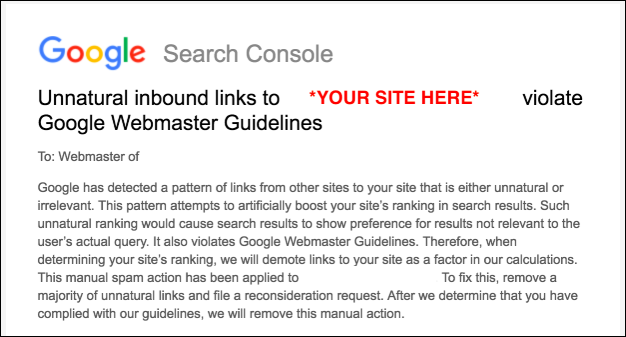 In reality, any offense to Google’s Webmaster Guidelines poses a threat to your site’s current rankings and long-term SEO health. The fact of the matter is that once you have an amazing product and incredible on-page content to go with it, acquiring links to that content will not only be more doable, but also more effective.